Reviewing the Technogel pillow, I really found it was like no other I had reviewed before and a good night's rest is important to all of us. This pillow has more weight than your normal pillow, but very soft and squishy. They have developed a line of bedding and pillows that are using innovative materials that provide a higher level of comfort for your good night's sleep.They are made from memory foam, so they are extra soft but still provide the support your body needs. They also using thermal conductivity that gives the pillows a cool feel and keeps you from getting overheated in the night. It comes with a washable cover and makes keeping it clean,easy. Extremely comfortable and would make a great Christmas gift for anyone. A restful night's sleep has positive effects on your mind and body, it determines the quality of your life. An appropriate pillow should be able to adapt and conform to your body. When choosing your new pillow, you cannot ignore looking at high quality products that can enrich your sleeping experience. 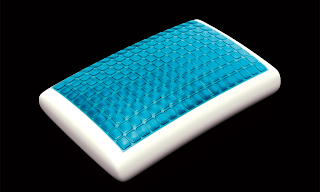 The Technogel® Sleeping pillows, made in Italy with particular care and attention to details, use high technical and innovative materials that allow a higher comfort performance. Technogel® is the unsurpassed 3-dimensional material for sleeping. The Technogel® layer, joined with the memory foam, adjusts in a gradual way adapting to each individual's shape. Furthermore, all the Technogel Sleeping pillows offer an Enjoyable Cool Feeling, thanks to the Technogel's good thermal conductivity that favors heat dispersion, helping to lower skin temperature. Technogel Sleeping would love to give away one of these pillows( SRP-$199) of your choice of style to one lucky winner from the USA only. A random draw will be held by Random.org on December 1, 2011 from all entries received. Does anyone in your home have troubles with sleeping? Yes, I only get about 4 hours of sleep a night. I often have trouble sleeping because I either can't get tired or can't get comfortable. My husband has a very hard time going to sleep and then wakes up in the middle of the night.